Earlier today, I got this direct message from an Instagram follower who made me feel so happy about being an inspiration the moment she came across my travel blog. I am not a famous travel blogger but receiving this kind of messages make me feel inspired to blog more despite the hectic schedule with work. It is not a step-by-step guide on how to make money with travel blogging because it never started like that but a personal experience on how I started travel blogging. There are several blogging platforms you can choose from, Blogger.com and WordPress.com. As a newbie blogger, I started with Blogger.com with my personal and photography blogs and WordPress.com for my travel blog. Back in the year of 2009, I created a blog as a hobby thus, a personal blog was born. A personal blog is a random post of mine about random things, stray cats we have at home, foods that I eat, events that I attended, a gadget I just acquired and just a small trip near my town but without photos. I just grabbed photos from somewhere, from friends and relatives so that I could save it on my computer and upload it on my blog. Related Article: How to Set Up a WordPress Blog with Hosting24? I always have a thing with photography ever since when I was a kid. I acquired my digital camera in 2009 through my earnings in an office job. Just taking photos of sceneries, flowers, insects – in short, just studying the camera how it works and with the help of Adobe Photoshop to edit photos. Joining blog communities give me the chance to meet other bloggers in Cebu. I was able to join some workshops in partnership with Google personalities in the Philippines who encourage us to blog and share information what we have in Cebu as a new media. Bloggers are not journalists, but we have the voice to exchange information on the blogosphere. Even journalists are now creating their blogs and enjoyed the perks of being a blogger. Through random blogging, it became an asset for me to get an online job. 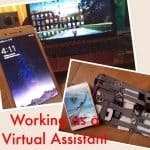 I mentioned that I am into writing, blogging, fast typing skills of 63 wpm with 100% accuracy, graphic designing, and photo editing. Since I’ve been earning with my online job, I bought domain names for my blogs to sound more professional. I knew from the start that traveling is an expensive activity. Having a digital camera and traveling to nearby areas from my town was a good start. I just wanted to practice how to write a travel blog about destinations, budget, and guides. Another thing is to show all those beautiful places with a simple camera. I never had the intention of making money with a travel blog. I just love taking photos and go somewhere; that’s all. I blog when I am home, not when I am traveling. Since I acquired a laptop and DSLR camera, I got inspired to level up my travel blog with more beautiful photos and enjoying myself to move while bringing my work. Related Article: How I Started Being a Digital Nomad? As you can see, I am not trying to be technical on this post because it’s hard to explain if you ask me about earning money while travel blogging which was not my primary purpose of creating a blog. Others created a travel blog to get free perks as the main intention. I started travel blogging in 2013, and it’s just this year I decided to move to a self-hosting for me to have more control of my blog especially for the web design. I need to level-up my travel blog as to show off my skills. You have to be passionate in blogging and earning money right comes after. But on the next blog post, I will share with you some of the things I did to make money to travel. I may not yet be a successful travel blogger where I could earn money full time in travel blogging. I may don’t have thousands of followers, but I am happy to say that some posts that I wrote have helped some people. Hoping that I’ll be inspired more to write my travel experiences. Thank you Sab for sending this message on Instagram. This entry was posted in FACT Inspire, Work and tagged blog, blogging, inspiration, travel, travel blog, travel blogging. Bookmark the permalink. Nice insight! Blogging should be borne out of passion to share and inspire people. Earnings, popularity, and freebies are usually the rewards of pursuing that passion. If one is blogging for the sake of money or freebies, then he/she is blogging for the wrong reasons. We can totally smell a blog that was created for the sole purpose of getting freebies and one that is written out of passion. We can only move forward. We get better every day as we keep on doing the right practice. I think the more we get expose in this blogging world the better we become. I am following your path..Hahaha..Wanted to be a travel blogger too someday just like you and work from the comfort of my own home.